Ideal Tax Solution, LLC is maintaining the priority status of its customer service platform as the financial service industry recognizes the explosive growth of tax resolution companies who can provide effective tax debt relief. Ideal Tax Solution, LLC is experiencing validation for its continued commitment to superior customer service for delinquent taxpayers in dire need of experienced tax liability resolution. The last quarter of 2012 reflected a positive customer bias toward the company’s stated policy of providing no less than the absolute best customer service to be found within the expanding professional tax relief industry. According to the resolved cases at Ideal Tax Solution, records indicate troubled taxpayers appreciated the elevated level of conscientious attention to customer satisfaction that considerably minimized the stress factors normally associated with the tax resolution process. From initial analysis to final phone call, it is obvious that taxpayers in desperate need of professional tax help, and, who have received support and guidance along every step of the debt resolution process, overwhelmingly welcome the added consideration afforded them during this tough time in their life. The tax resolution industry has evolved into far more than a collection of simple ‘black and white’ mathematical equations. Tax liability specialists must utilize all facets of a professional debt relief process to assure adherence to proven debt resolution policies is achieved. 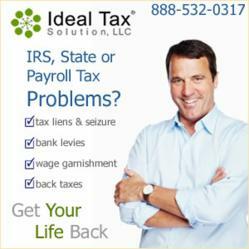 A proper mindset for the experienced tax help specialists at Ideal Tax Solution is one that encompasses an appropriate psychological perspective, in addition to the knowledge and skills necessary to formulate a successful strategy for resolving a tax debt situation, every one of which is unique. A multi-faceted approach to tax liability resolution must include an attitude of genuine customer service, which will guarantee nothing less than the most expedient path possible is taken to insure a prompt, effective and smooth road to resolution. Ignoring the very real and natural emotional needs of a delinquent taxpayer trying to regain their taxpayer in good standing status, is a recipe for unsatisfactory results and a blueprint for bad public relations. Striving to consistently achieve and maintain their status as a go-to company for professional tax relief, Ideal Tax Solution is constantly pushing the upward boundaries of exemplary customer service in an industry poised for continued growth in the foreseeable future.